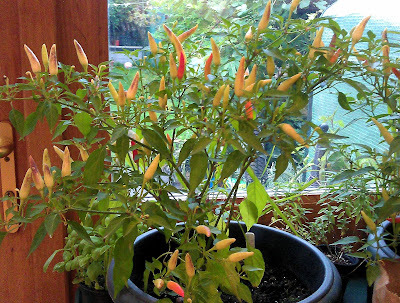 One chilli that won't be coming in for the winter is the Hot Lemon plant, This has plenty of ripe fruits ready for harvesting, and I don't have the space inside for a plant that has had all its fruit harvested and which is not growing any more. This variety always crops well in a pot on the patio, where it's sunny and reasonably sheltered. It produces large numbers of green fruit in late summer, which are astringent, but relatively mild early in the season. 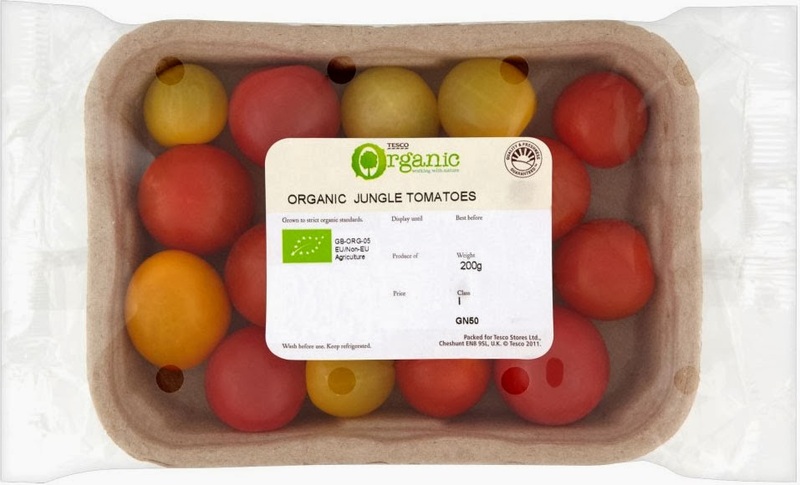 They ripen to yellow in autumn and the flavour matures, and heats up, always retaining those distinctive citrus notes. 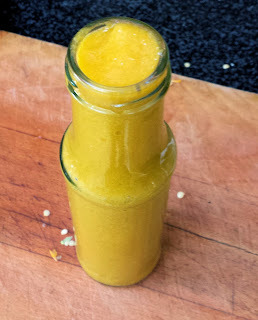 I wanted to make a chilli sauce with the 2013 harvest, one that I could store next to the bright red habanero sauce and my favourite green pepper sauce. Nearly all the recipes I looked at contained tomatoes which bulk out the sauce and add a fruity taste. I’m happy with that, but I did want to preserve the bright sunshiney yellow of the lemon chillies. 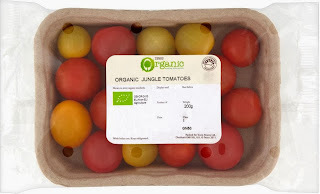 So I set off to try to find yellow tomatoes to use with my chillies, in England, in November. And found them almost immediately in Tesco. Put the vinegar and sugar into a pan. Give the chillies a quick wash, remove the stalks and chop roughly. Don’t worry about removing seeds. Add them to the pan. Chop the tomatoes and add them too. Cut the stalks off the pepper, if using, scoop out the seeds and the white membrane, chop roughly and add that too. Adding the sweet pepper helps to give the sauce a bit of body but too much of it makes it taste bitter, paradoxically. Bring the ingredients in the pan to the boil, add the water, turn down the heat and simmer very gently, covered for about 15 minutes until the peppers and tomato have softened. Remove the lid and continue simmering for another 5 mins. Remove from the heat and leave to cool a little while you sterilise a jar. Liquidise in a blender until smooth, then taste – carefully, it should have a kick like a mule. Add a teasp of vinegar or sugar if you think the sauce needs sharpening or sweetening. Push through a sieve to get rid of any seeds, pips or bits of tomato skin. Pour into the sterilised jar, seal and label. Rather than throwing away the leftover seeds, and skins, try this idea from the community section of Nigella Lawson's website, posted by 'kenkrahn' on http://www.nigella.com/recipes/view/sweet-orange-chilli-sauce-1739: take the leftover bits of skins, seed and pith, and spread them out on greaseproof paper (the recipe says a cookie sheet). Once dry this mash can be pulverised in a spice grinder to make your own chilli powder. No wastage whatsoever. 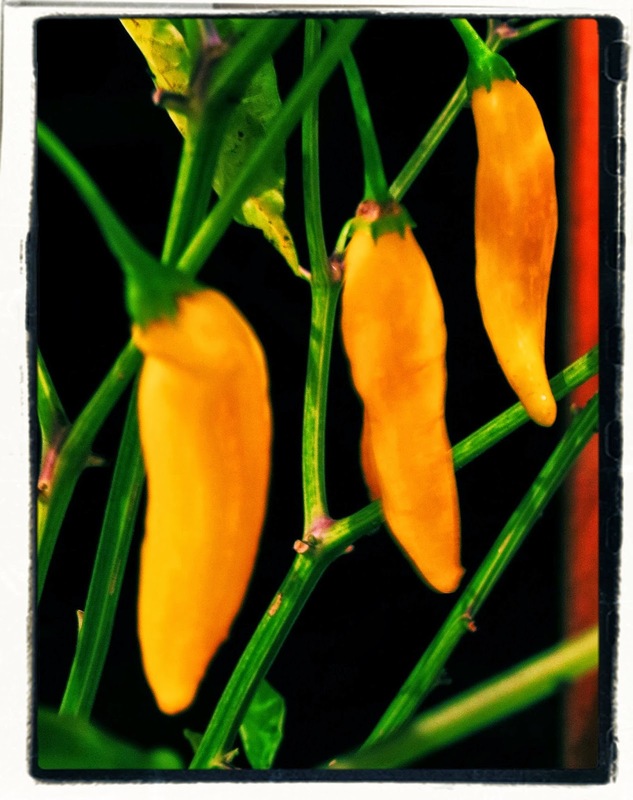 These lemon chillies also make terrific chilli jelly (it's the last item in the post) - full of flavour, hot and zingy and fruity, all at the same time. In her excellent book Salt Sugar Smoke, Diana Henry gives a stunning sounding recipe for sweet fig vinegar. Given that the figs from our tree get eaten as soon as they are picked, the chances of accumulating enough figs to make a vinegar seem remote. But I did wonder if the same principles could be used to make a quince vinegar from my quince glut this year. 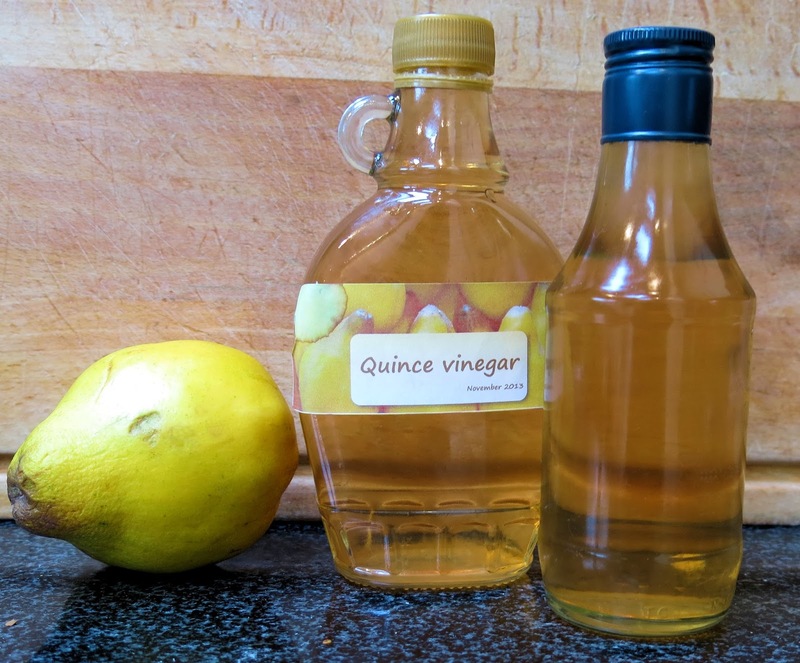 The resulting vinegar has a tantalising aroma – almost rose-like, the perfumed apple scent that has been filling my kitchen since the quinces were picked from the tree. This is a sweet vinegar, good for salad dressings, adding to sauces, etc. Bake the quinces whole in a little water for about an hour or until soft, sprinkling a little sugar over them to tease out the juices. Chop the quinces roughly, removing stalk and pips, and pile into a sterilised 1-litre jar. Pour over the vinegar and squish the quince pieces in the vinegar with a potato masher if the neck of the jar is wide enough, a or a spoon if it isn’t. Seal the jar and leave it for about a week or two, turning it over and squishing again occasionally. Next, strain the quince and vinegar through a muslin, jellyag or unused J-Cloth into a measuring jug. For every 300ml vinegar, weigh out 225g sugar. Pour the vinegar into a pan, add the requisite amount of sugar and bring to the boil stirring to ensure the sugar is dissolved. Simmer for five minutes, then leave to cool. While it’s cooling, wash and sterilise a jar just big enough to take the vinegar, then pour it in, seal and keep somewhere cool and dark. The glut of quinces from the crop I picked last month has just about been finished – I have precisely two quinces left. Apart from the quince vinegar here and the quince jelly and quince cheese, blogged here for the Secret Garden Club, I’ve also used the following recipes to make quince dishes. My family is going to be so pleased when they are finally gone! Quince tart, originally from The Cook's Companion, The Complete Book of Ingredients and Recipes for the Australian Kitchen, Stephanie Alexander. Quince relish, originally from Purple Citrus & Sweet Perfume, Silvena Rowe. 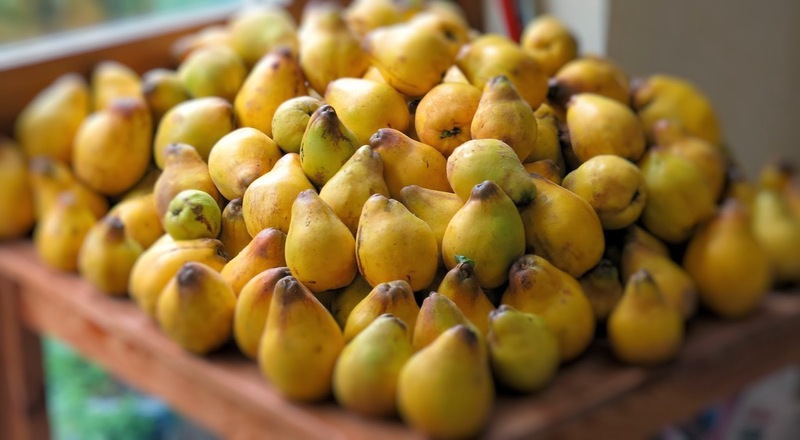 Pear and rocket salad – but with quinces (recipe from Aegean Flavours, Didem Senol). We've already had the first frost in London and there's more sub-zero nights on the way, according to the weather forecast. Time to bring in the rest of the plants. Most of my spice plants – cardamom, turmeric, ginger and pandan - are already safely indoors, but the chillies and citrus were still out until the weekend. Chillies will overwinter quite happily, best somewhere with plenty of light, not over-warm, but definitely frost-free. They may well lose many leaves, but you should see new growth in January. And while you won’t get chillies developing all year round you will get some very early fruits in the next spring. They are however quite short-lived perennials, only lasting 2-3 years in any case. Citrus plants, for all that they like the wide variations in temperature - warm days and cool nights - won't stand any frost at all. They need to come indoors and spend winter in a cool place - between 7 and 13 degrees Celsius. They don't like very dry air, and they don't need much in the way of watering over the winter months. 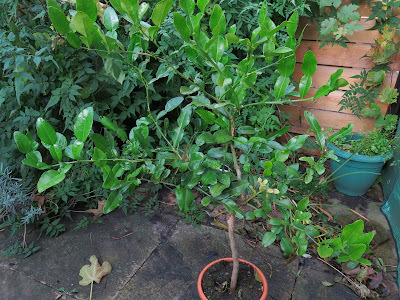 Kaffir lime, ready for clean-up before coming indoors. Before the plants come in, however, they will need to be cleaned up. With chillies especially, you'll often find an infestation of aphids takes hold about three weeks or so after bringing them in. Aphids are perhaps easier to prevent than cure. On inspection, your citrus plants too may be harbouring pests that need to be removed before relocating indoors. Mine tend to be susceptible to scale, which can be rubbed off or scrubbed away with an old toothbrush. Check particularly on the underside of leaves alongside the central vein. Left, scale insects lurking on the leaves; right, snail leaves its last trail on this particular plant. I often find tiny snails hiding in the foliage of both chillies and citrus: dispose of these so they don't get to spend all winter chomping away on your leaves. So the plants all get a bit of a spruce-up before being allowed to cross the threshold. First I remove any tatty, holey, yellowing leaves, any withered or brown stems, old flowerheads, etc. Any weeds that have seeded in the pots (perish the thought!) are removed. Cleaning up the smaller plants is easily done by dunking them in soapy water, I'm indebted to citrus specialist Plants4Presents for this tip: it's a lot less fiddly than going over the whole plant with a handheld spray, sponge and toothbrush. Tie a clear plastic bag around the pot and the base of the main stem, fill a sink (or a bath if you have several plants) with soapy water (lukewarm water plus detergent to the same dilution as if you were washing up will do fine), up-end the plant and dunk it, leaves first, into the sink (bath). Count to five and haul it out again. Leave it to drain, right way up, before putting it in its final overwintering place. This should stop any aphids lurking in the leaves in their tracks. If you get any further infestations during the winter, repeat the process. Brassicas and I frequently don't see eye to eye. For every Savoy cabbage that plumps up like a football, there'll be two more that never really get started. And yet I'm lucky in many respects. I don't have cabbage clubroot, or cabbage root fly. A lot of whitefly, yes, and if I don't throw a net over the plants, the pigeons and the caterpillars think all their Christmases have come at once. 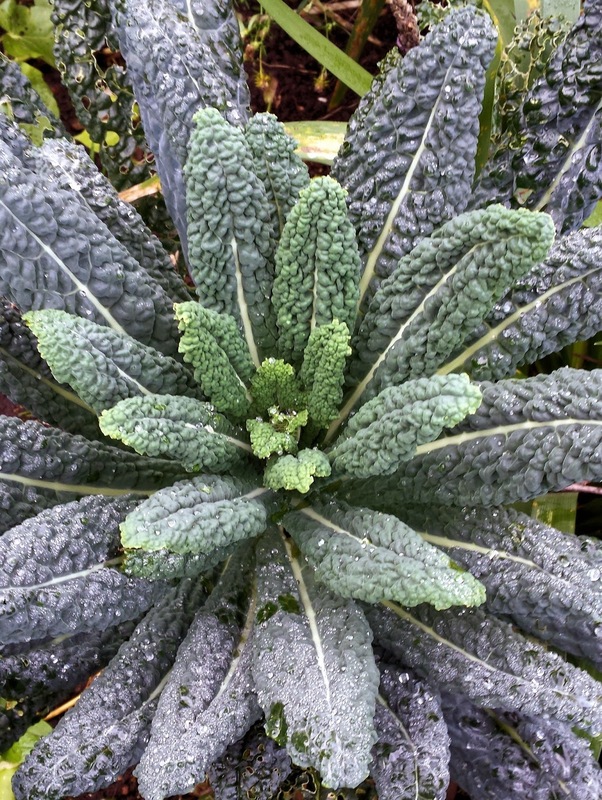 But in general, I think I'm just a bit inept at growing brassicas. I'll grow cavolo nero (and wonder why it grows so much better in the Secret Garden, pictured above, than on my own plot), and purple sprouting, Chinese broccoli (kailans) in spring and reasonably satisfactory broccoli for the winter. The kailans are a bit of a law unto themselves but the others are pretty reliable. I'm also improving with the broccoli Romanesco - often called cauliflower Romanesco. 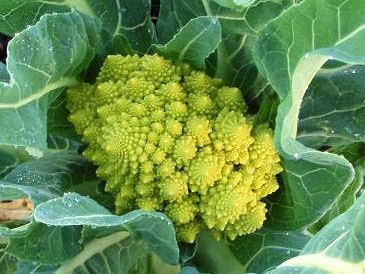 This most delicious and intriguingly beautiful of brassicas is the plant which produces pale green fractal whorls in a triangular tower. It looks more like a science project viewed under a microscope than a vegetable. It's delicious to eat - especially with an anchovy sauce, or with bacon lardons - and difficult to find in shops outside farmers' markets. All of which goes to make it one of the first items on the allotment Most Wanted list. This year, we've had a couple of good meals with some medium-sized heads. but I notice that about a third of the plants have come up 'blind'. Instead of a bud, or head, there is just a bare green stub at the centre of the plant. The leaf growth however is noticeably abundant. 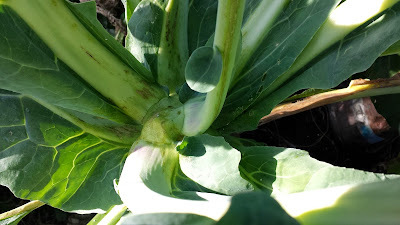 central bud, or cauli head. any of the above (Stefan Buczacki, Pests, Diseases and Disorders of Plants). The drying out suggestion makes the most sense to me. We had low temperatures until very late spring, but I didn't plant them out until June, by which time we were well over the winter chill. I'd never heard of Swede midge before now, but I've examined the plants very carefully and can't find any traces of insect activity at all. Broccoli, like so many other veg, dislike any check in their growth, including a sudden drought. Something to look out for next year, when hopefully they will all produce beautiful green caulis. My quince tree is only four years old but has become a much-loved staple of the allotment in that short time. For its delicately beautiful blossom late in spring, and the reliable crop of fruit which turn from green to bright yellow very quickly in October, it's a distinctive and much-commented on tree. Last year, many of the comments centred on the lack of fruit as a very late frost wiped out the blossom and I only had two quinces to pick come the autumn. This year, as if to make up for it, the tree has produced a glut of nearly 200 golden quinces. When buying the tree, I chose the variety Meeches Prolific for its early cropping and the large size of the fruit. So far, most of the quinces picked weight in at over 300g, and I've had one or two individual fruit over 500g. The other most common variety sold in the UK is Vranja although there are many others if you scour the catalogues. 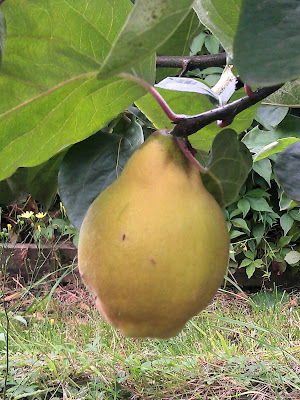 The good news is that quinces trees are self-fertile, so you only need one tree, and very hardy. In their native middle east they grow on the hills where it is hot and sunny in the day but can get very cold at night. So, while you don't need to worry about frosts, the trees should be planted in a sheltered position to make the most of our summer sun. Of my 200 quinces this year, about half were given away to friends and family. We made quince jelly at the Secret Garden Club, and guest took away quinces to cook and eat at home. Of the rest, I've made more jelly, and sticky smooth quince cheese with the remaining pulp - see here for the full recipe. There is quince vinegar on the go, and we've had poached quinces, quince tarte tatin, baked quinces, and spiced quinces. One of the points in the quince's favour is how well it lends itself to being preserved - I think we would all be very fed up of quinces by now if we'd had to eat all of them at once. As it is, the quince mountain has been reduced to a small hillock and we still have the quince cheese, jelly and pickled quinces to look forward to. I'm particularly looking forward to the pickled fruit with its clear golden colour and rich spicing. 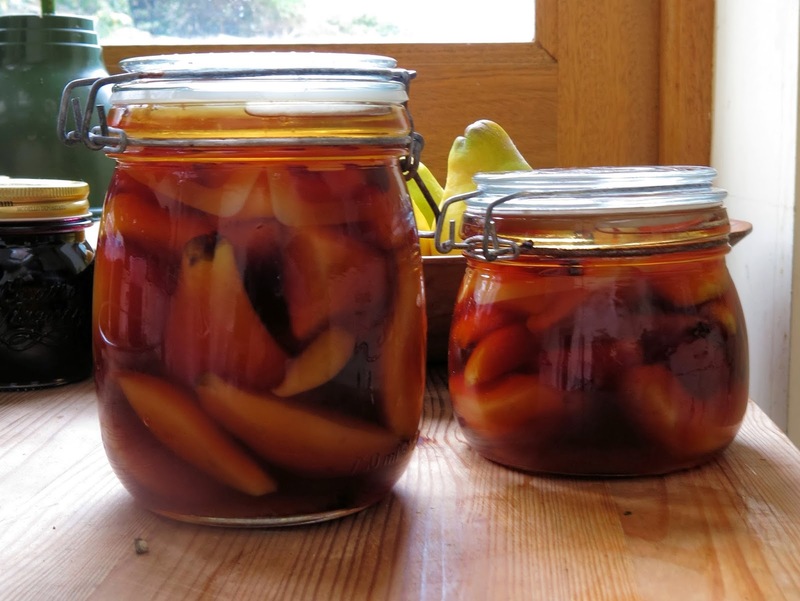 This is a fairly standard pickled quince recipe. The spicing comes from the recipe in the excellent National Trust book Jams, Preserves and Edible Gifts, and I've added a couple of whole chillies for an extra kick, as well as keeping the ginger slices in the syrup with the quinces. It's definitely worth using brown sugar for this to help the quinces turn a lovely golden colour. Sterilise a jar or jars to hold 1.5l and put in the oven at 120 degrees to dry off. Crush the allspice and peppercorns lightly, then tie these, plus the strips of lemon rind, in a muslin bag. Heat the vinegar and sugar together in a large pan, stirring to dissolve the sugar, then bringing to the boil. Meanwhile peel, core and quarter the quinces. If the quinces are very big, you could slice the quarters again. 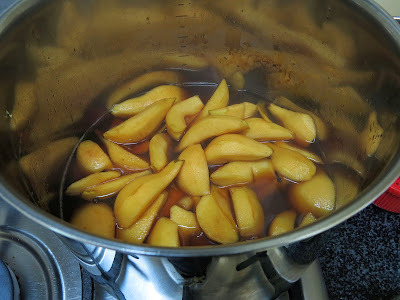 Toss the slices in the lemon juice to stop them discolouring, and when the vinegar and sugar syrup has been simmering for 5 minutes, add the quinces and lemon juice to the pan. Add the spices in muslin, plus the cloves, ginger slices, cinnamon stick, and chillies, and bring back to the boil. Simmer for about 20 minutes, when the quince slices should have softened. Take off the heat and remove the muslin bag. Ladle the quinces, ginger slices, cloves, chillies and cinnamon stick into the jar or jars, and pour the remaining syrup over them. Seal and cover the jars and leaves to cool before labelling and storing in a cool, dark place. This is a very easy way to enjoy the delicate, perfumed taste of quinces, but what I found especially interesting this year was how the nicest poached quinces were the ones made to the simplest recipe. I started off with poaching the fruits in vermouth, with vanilla and sugar added, and while they were nice enough, I think the flavour of the fruit was somewhat overpowered by the alcohol. Put the water and sugar into a large pan, and set on a low to medium heat. Stir to dissolve the sugar then raise the heat and bring to the boil. Lower the heat again to a simmer and add the lemon juice and vanilla pod. Meanwhile, peel the quinces, cut into quarters and remove the cores, then slice each quarter lengthways again - so that you end up with eighths. Add them to the pan as you cut them, so that they don't discolour. Turn the heat down very low, so that the syrup just bubbles. Cover the pan, and let the quince simmer gently until soft - about 20-30 minutes. Remove from the heat and leave the quince slices in the syrup to cool. Spoon the quince on to a plate, add a little syrup and serve with creme fraiche or ice cream.